I toyed with the idea of doing a big retrospective, but truthfully I didn’t do all that much crafty in 2011. We did A TON of work on our house and that took a good 6-9 months of concentrated effort. 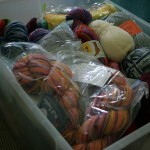 So I ended 2011 in a good place – a house with no active renovation projects and a smaller stash because I sold quite a bit of the yarn I didn’t want to use. For 2012 I do have a few simple goals. Continue with weight loss. I increased last year’s goal to 15 pounds and I only got to 7. I struggled for a while with this but I need to remember – I’m still 7 pounds less than I was a year ago, and slow weight loss stays off. I’m going to reset my yearly goal to 10. Always have a commuting-friendly project OTN. Shop my stash first, but don’t make it a chore. If I have a great idea and the stash can’t support it, allow myself to buy without the guilt. Continue working on weeknight meals. I still need to find my groove with that. 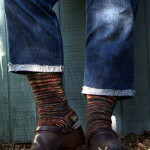 Figure out how to make sewing more a part of my weekly crafting. I have a hard time working sewing into my life. 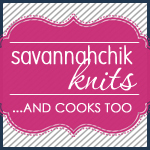 Knitting is just so portable and stop and go, but sewing is so instant gratification. I need to find the sweet spot for sewing. 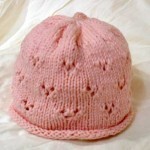 And lest you think this is all about things I want to do in 2012, here’s my first FO of the year – Lintilla! I love this project – the simplicity and cleverness of the pattern, the easy knitting of garter combined with the little ruffles and the ease of stopping and starting at any point (I put this project down for over a month and picked it back up without a problem). My only regret is that it’s a bit smaller than I’d like, but that’s not a surprise. 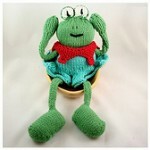 The original was knit in Wollmeise (575 yards per skein) and I knit mine out of Miss Babs Yummy (400 yards per skein). 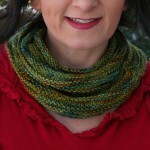 One thing I like about many of Martina Behm’s shawl and scarf patterns is that she writes them not in terms of number of rows or inches, but rather percentage of the entire skein. 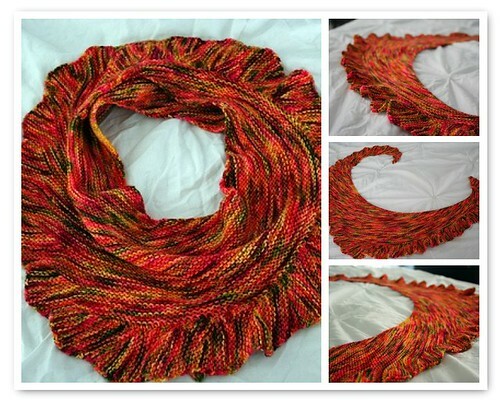 So, regardless of your yardage you can create the entire shape of the shawl and use up almost your entire skein. My scarf used up 90% of the skein, so I had 40 yards left over. I don’t think I would have been able to get another full repeat in though – those final rows were using approx 5 grams for each set of rows. percentage directions so I can use up most of my yarn. I’m going to make mine in Creatively Dyed Waterfalls – a handdyed heavy laceweight of purples with a bit of pink and white. 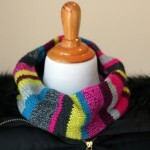 It coordinates with about 70% of my wardrobe so I can envision using it as a scarf or a wrap around the office. 1,300 yards will definitely be longer term so I don’t expect to finish this until next fall/winter. Those are all very sensible goal, I am still trying to work on my meal planning as well. Love your Lintilla. I think the colors you have chosen for your Nuvem are fantastic! Those sound like great goals– especially the sewing I think your steady weight loss is quite impressive, even if it was slower than you liked. Lintilla is beautiful! That’s a shawl pattern I’m actually tempted to knit.